Use of digital images enables us to preserve the wonderful moments of our life. You can transfer and save essential pictures on your Windows 8 system for security reason. When you are dealing with a huge amount of files on your computer, somehow you may delete some photos. If any of your vital images are deleted, no need to worry. You can recover pictures deleted from Windows 8 system using this Windows 8 Data Recovery software. This application is capable to retrieve all types of images deleted from your system with ease. In general, pictures from the Windows 8 or any other computer are deleted by the use due to their own fault. Occasionally, we delete redundant data or images from our system to free up the occupied memory space and for effective use of the limited storage drive. During deletion of the unnecessary photo, if you unknowingly select some important images, it will be a big problem for you. If you delete them using the ‘Shift + Delete’ keys, it will be more difficult for you to restore them. In such cases, you can restore deleted photos using this prominent application effortlessly. In some instances, use of some third-party software installed in your Windows 8 system is accountable to the photo deletion. When you preview images on your Windows computer, you may delete it accidentally. Besides that, pictures on your system may also be deleted after utilization of an inappropriate tool to remove unused or temporary files from the computer. Even, if you delete any beloved picture from the Recycle Bin also, do not think that it is impossible to recover pictures deleted from the Windows 8 Recycle Bin. Windows 8 Data Recovery tool is very effective to retrieve Recycle Bin deleted files as a whole. Note: Make use of this link http://www.windows8datarecovery.net/recover-shift-deleted-folder.html to know in detail about how to recover shift-deleted files from the Windows with ease. 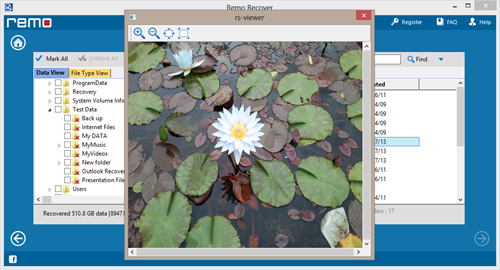 Step 1: Install and launch the recovery application on your Windows 8 system and select "Recover Photos" option from the home screen as shown in below figure. Step 2: Now, select the suitable hard drive partition from where you deleted images and click on "Next" button to initiate the recovery process on that drive. Step 3: When the recovery process will over, you will get a list of the restored data. You can "Preview" them before save.